Mosqueta Rosehip Oil is recognized as a Chilean emblematic product, used in the cosmetic industry for its excellent regenerative properties. The more knowledgeable of the product the market is – as the German market – the greater the demand for the oil in its purest form, in bottles of 15 ml to maintain its properties intact, since when larger containers are used it is necessary to add an antioxidant (vitamin E, generally). •	Its purity, endorsed by a composition analysis. 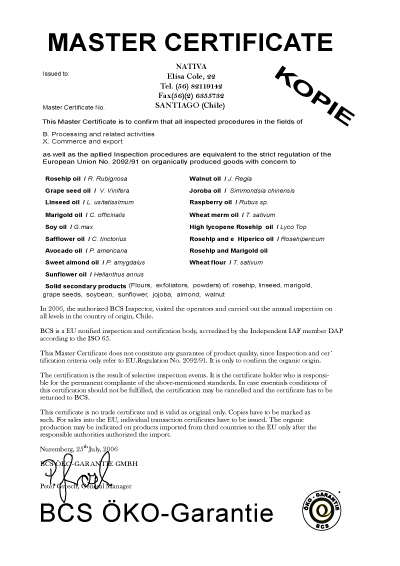 •	Quality Certification of the country of origin. •	Product certified by the Health Authorities of that country. Chile has an area of approximately 35,000 hectares of wild Rosehip (Rosa Mosqueta), which has grown naturally. Harvesting the fruits is a very delicate task, as the only way to do it is to hand-pick them one by one. Most pickers prefer to sell the fruit to large companies and let them extract the oil. These large companies have developed many methods and treatments, in order to make the most of the fruit and rosehip seeds and be able to meet the enormous demand. Currently even the plant is being grown in nurseries, where it is genetically modified, since the natural species cannot be cultivated and can only be found wild. In this process, after the first cold-pressed oil is obtained, the seeds are further processed and re-pressed until there is no more oil left. The presentation is diverse in formats and quantities. When the oil is refined, it goes through a chemical process that usually alters its quality, as part of the substances used in the refinement end up in the oil. That is the reason for the enormous differences in prices in the market, which depend directly on the purity of the oil. In many cases what is labelled as 100% Mosqueta Rosehip Oil should be called 100% Mosqueta Rosehip Refined Oil. In short, the use of methods to increase the yield means using chemicals, including hexane, whose compounds are considered carcinogenic and are classified as hazardous to human health and the environment. 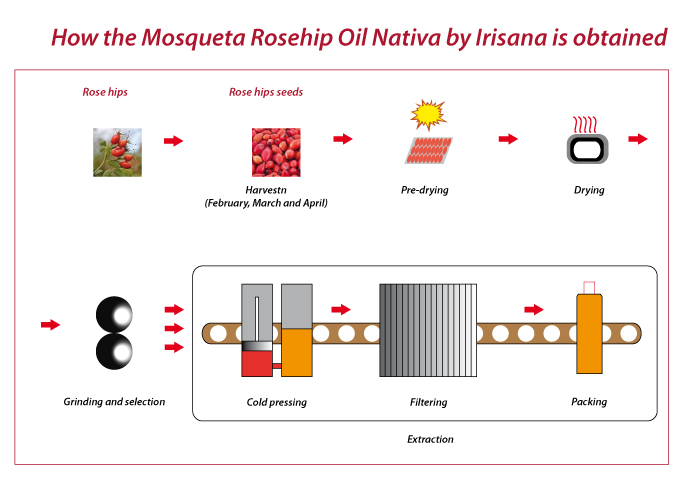 Also during the refining process the oil is subjected to temperatures than can exceed 243º C.
The pure Mosqueta Rosehip Oil Nativa by Irisana is 100% natural, and no chemicals are used during the extracting process, thereby its properties remain intact. The production is limited to 30,000 litres per year. Harvest – it takes place during the months of February, March and April. The hips of the Rosa Mosqueta are harvested by hand to avoid damaging them. Pre-drying of the fruit – it is done in appropriate places, using the maximum of solar energy in the process. Drying – The fruit is placed in trays and the drying process ends in the drying oven, at temperatures that do not alter its characteristics. Selection – The dried fruit is ground and then carefully selected. At this stage the fruit is separated from the seeds. Oil Extraction – The seeds of the Rosa Mosqueta are subjected to a delicate and careful extraction process by mechanical cold pressing, from which the Mosqueta Rosehip oil is obtained. The extraction method is based on the cold press, in which excess heat is prevented during compression so as not to damage the active thermolabile components or those susceptible to losing their activity at high temperatures, such as the retinoic acid. Heat is bad for the oil and inhibits its properties in more than 70%. 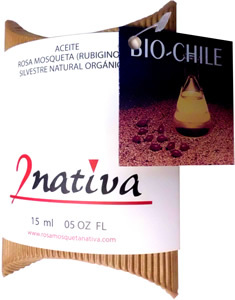 That is why old grinding methods, like stone mills, are used, or as in our case, by pressing the seeds with low resistance expellers in which the driving speed of the screw is controlled, with temperatures never exceeding 50º C.
The Mosqueta Rosehip Oil Nativa by Irisana is certified with the BIOCHILE label. For a BIO Certification to be truly effective and justified, it must be extended for a limited and renewable period, to ensure that the participant follows and respects the implementation of the rules established by the certification authorities scrupulously. Too often today, BIO certifications are issued permanently, after a single visit, without subsequent monitoring, and sometimes without any visits at all. Therefore, there is nothing that can guarantee that the products from such programmes, which are fortunately rare, are truly BIO. This is not the case with the BIO programme established by BCS-Öko Garantie for Nativa. The certification of BCS-Öko Garantie starts at the source, in Chile, with the fruit harvest, and then the monitoring of the oil production, post-production, packaging and transport (all the steps implemented and controlled by BCS Öko Garantie). Experienced inspectors make regular visits to the fields. They are often local people who have a deep knowledge of the environment and see their BIO responsibility as a real mission. 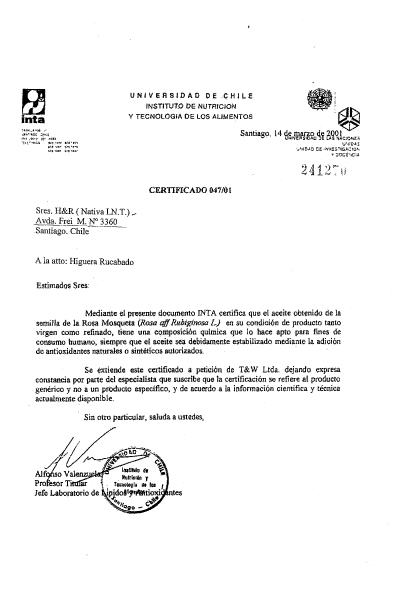 Moreover, a careful list of full production conditions is documented, step by step, and made available to inspectors at all times, as well as other documents that are part of the BIO traceability system. These programmes ensure impeccable production standards. 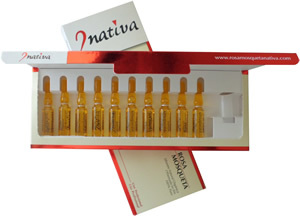 The Mosqueta Rosehip Oil Nativa by Irisana is marketed in the following formats: 15 ml. roll-on bottles and boxes of 10 single doses of 2ml for professional use. In markets with a high knowledge of the Mosqueta Rosehip Oil, such as the German market, it is used in its purest form, in containers of 15 ml to maintain its properties, since larger quantities need the addition of antioxidants for its conservation. .